Spektrum DX8 - What's so great about it? So what's all the buzz about the new Spektrum DX8? Other than the fact that it has 8 channels, what makes it any different from any of the other Spektrum transmitters? The coolest feature by far is the built in telemetry capabilities. A back lit screen, built in charger, SD memory card reader, vibration alarms, tension adjustable gimbals, and the powerful new Spektrum AirWare software is just icing on the cake! Typical radio systems we've used for years work just like a one-way conversation. The transmitters do all the talking while the receivers do all the listening. Those days are over. Now there are tiny transmitters available that ride inside our airplanes that actually send data back to our transmitters. Pretty cool huh? Here's how it works. 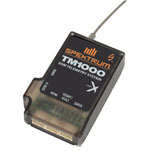 The Spektrum DX8 comes with the TM 1000 telemetry module. This module plugs into the data port of the included AR8000 Receiver. This TM 100 module has three ports for plugging in various sensors such as the included temperature and voltage sensor. There are a multitude of other sensors available to monitor the vitals of your airplane in real time. In fact, there are so many uses for telemetry that I've dedicated an entire page explaining the practical uses of telemetry and a summary of available equipment. 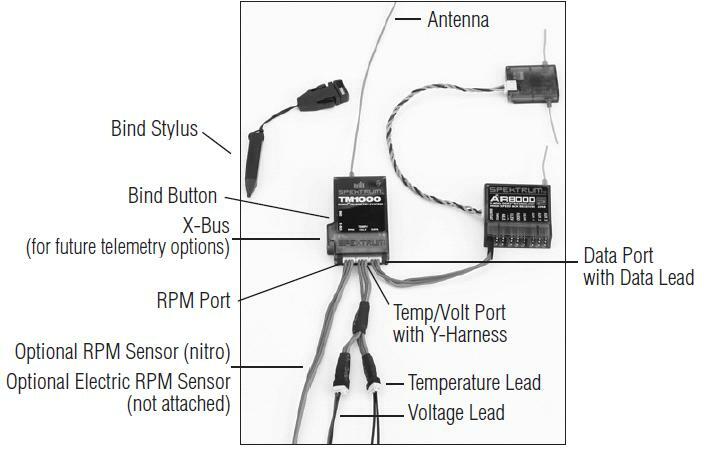 Follow this link for an in depth discussion of telemetry for RC planes. Let's get on to the other appealing features of the Spekrum DX8. The Spektrum DX8 has another pretty cool feature that you've probably wished you had at one timer or another. It has a back lit screen. How many times have you looked at your transmitter's screen and seen nothing but the reflection of the sun? Or how about those flights at dusk when there's not enough light to see the screen? The illuminated screen makes it easy to see your transmitter's menu no matter what the conditions are. The Spektrum DX transmitter holds up to 30 models on its internal memory alone! But what really sets this radio apart from any other radio is that fact that it has an SD memory card reader. This means that you can save an unlimited amount of models to your computer. For the first time, you can now email a friend a certain model mix or set up or share setup files online with other pilots. This feature really makes it easy to help each other out as far as programming goes. You can also get firmware updates from Spektrum via the internet to add features or to address any software problems or glitches. The transmitter comes with a 16MB card, which isn't exactly cheap! The DX8 sports Spektrum's latest Airware Software that has built in programming for just about any scenario that you can imagine. This includes all fixed wing types and 4 swash plate types for the heli guys. In other words, there isn't an airplane or heli out their than can't be flown with one of the pre-programmed mixed included with the Spectrum DX8. You no longer have to be a computer or programming whiz to figure out how to set up your airplane. Just scroll through the mixes and find the one for your application. If you happen to be the type that enjoys setting up your own mixes, you will be glad to know that there are 6 custom programmable mixes. Another great feature is that all of the switches on top of the transmitter can assigned any way you like. 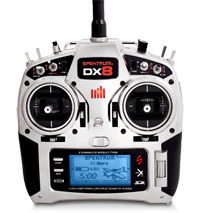 The Spektrum DX8 actually has a battery charger built into the transmitter. The charge jack is non-polarity-critical. So you can use the included AC/DC power supply that plugs into the wall, or you can use any 12 volt power supply such as cigarette lighter etc. The internal charger can charge both the included 4-cell 2000mAh 4.8V NiMH Transmitter Battery or the optional 2-cell 4000mAh LiPo transmitter battery. Another feature we haven't seen before from Spektrum is the special rubber on the back and sides of the radio that actually conforms to the shape of yours hands. This may not seem like such a big deal, but it can make a big difference on those intense flights when you tend to have a death grip on the TX! The gimbals themselves have been upgraded from previous radios with a set of quad bearings giving a nice solid smooth feel in flight. The spring tension and length of the gimbals can be adjusted to the exact feel that you're comfortable with. The Spektrum DX8 comes as a conventional mode 2 setup. But it can easily be switched to mode 1, 2 or 4 in a matter of minutes. The best part about this radio is that you don't have to take out a second mortgage on the house to pay for it. You really can't beat the price of the DX8 considering all the features, components, and extras that come with it!